Thank you San Carlos Hammer Down Fishing Tournament! 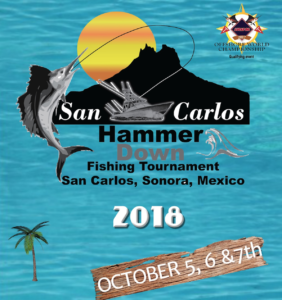 The 2018 San Carlos Hammer Down Fishing Tournament took place from October 5 – 7th, during the Columbus Day / Canadian Thanksgiving weekend. Even though the fishing was described as spotty, there was a really good turnout and those who participated had a great time. This year Rescate received an extremely generous donation from the tournament, which supports many San Carlos organizations. Many, many thanks to Wade and Judy Earl who are the amazingly dedicated organizers of this annual event and also to the sponsors of the tournament. Thank you for your generosity and for helping us keep Rescate in our community! Many thanks also to Rescate Board members Debbie Storm, Kathy Rodgers and Diane Barroll who helped with many of the tournament’s functions. 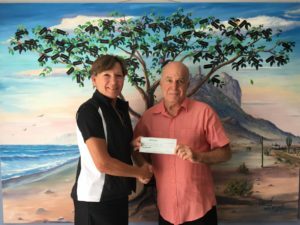 Diane Barroll presented the check on behalf of Friends of Sonora (Hammer Down Fishing Tournament) to Rescate President Dr. Glenn Lippman. ← Marinaterra Hotel Supports Rescate!